Paper Folding Machines - Fold hundreds of sheets of paper in minutes! Folding Machines will save hours of manual labour whilst producing a quality finish to your documents. Whether you fold 100, or 100,000 sheets of paper per month, Paper Folding Machines are essential for improving productivity and efficiency. Whats The Difference Between a Cheap Machine & Ours? Our Paper Folding Machines offer features such as high capacity feeders, meaning you can place hundreds of sheets of paper into a feeder at one time, they utilise a conveyor stacker meaning the finished product is stacked in order and is easily managed. Our machines are extremely reliable meaning no jams, torn paper, and a constant efficient and reliable workflow. 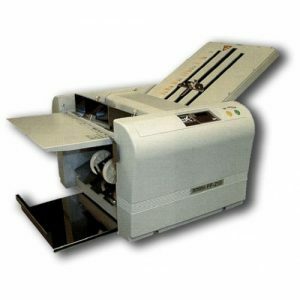 Folding and Inserting Machines Also Available! The EP-42F is our easiest machine to use, it’s a versatile unit which is super reliable and is perfectly priced to give you great value for money. 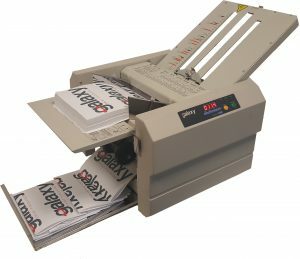 Easily the best value for money Paper Folding Machine on the Market. – FOLDS A3 & A4! The FP-RD 298 Paper Folding Machine is a robust machine that will cope with Glossy paper and occasional high volumes all at a great price. CALL – 1300 943 274 for configuration & price details! 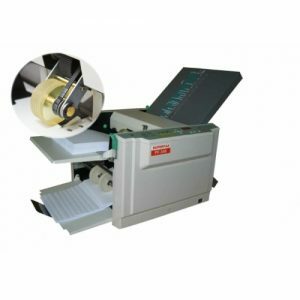 The Superfax 215 Paper Folding Machine is Japanese made and capable of printshop volumes, Superfax 215 is an ideal machine for regular high volumes of paper folding. 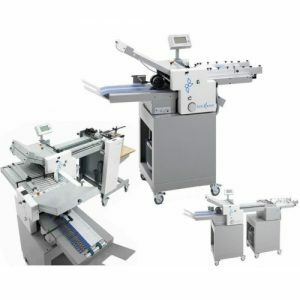 FOLDMASTER PAPER FOLDING EQUIPMENT IS DESIGNED FOR LARGE CORPORATE AND PROFESSIONAL PRINT SHOP VOLUMES. The Foldmaster system is modular, meaning you can add options such as cross-fold or batch counters as your requirements change. Foldmaster equipment is modular with many options. Please contact us to confirm pricing.